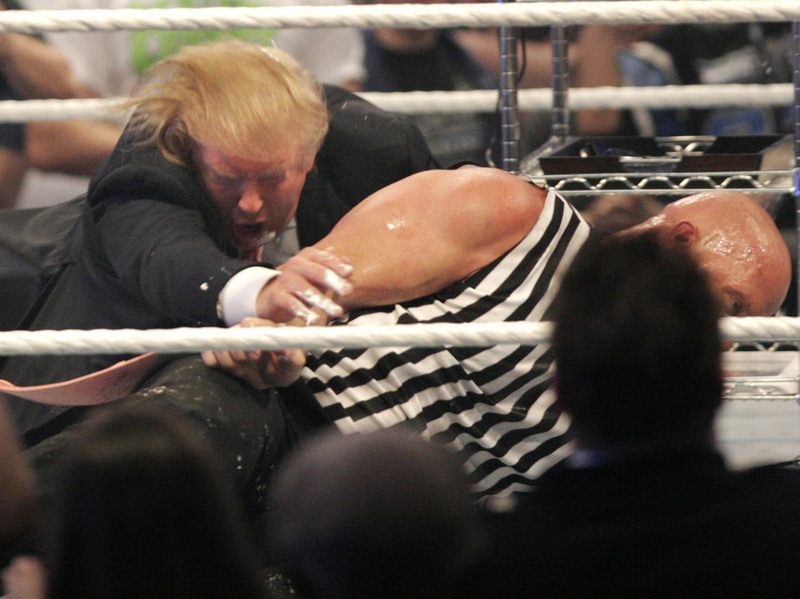 4 Ways Donald Trump's Pro Wrestling Experience Is Like His Campaign Today At least none of Trump's political opponents have been strapped down and had their heads shaved by him. 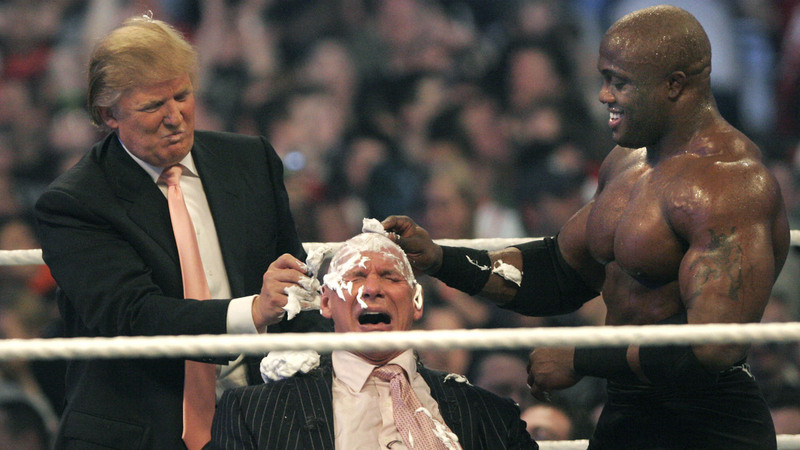 WWE chairman Vince McMahon (C) has his head shaved by Donald Trump (L) and Bobby Lashley (R) after losing a bet in the Battle of the Billionaires at the 2007 World Wrestling Entertainment's Wrestlemania in Detroit, Michigan. Donald Trump's dominance over the Republican presidential field has come as a surprise to the political world. But followers of professional wrestling may be less surprised that Trump has managed to knock more than a dozen Republican candidates out of the race. Trump's stint in the pro wrestling world dates back to 2007 when NBC wanted to cross-promote Trump's show, The Apprentice, on its other properties. He appeared on Wrestlemania XXIII in what was billed as the Hair vs. Hair match and the Battle of the Billionaires against Vince McMahon, the CEO of World Wrestling Entertainment. Trump was game for anything, said Court Bauer, a writer on WWE who helped create the Trump storyline. He was even willing to yank on his own hair to prove it was real although the show's creators ultimately decided against that move. But Trump did end up clotheslining McMahon, helping strap him to a chair and shaving McMahon's head on-air after McMahon's favored wrestler lost the match. Here are four ways Trump's performance on WWE continues to echo in his campaign for the Republican nomination today. Trump's attacks on his political rivals remind Scott Beekman, author of "Ringside: A History of Professional Wrestling in America," of a promo, the insulting monologue about his opponents that a wrestler delivers before a match. "I think [Trump is] best when he's riffing off an opponent and has an opponent right there that he can try to knock down a few pegs," said Beekman, who's also an associate professor of history at the University of Rio Grande. In 2007, Trump taunted McMahon, telling him, "I'm taller than you. I'm better looking than you. I think, I'm stronger than you." Nine years later, Trump's insults have spawned attempts at a comprehensive taxonomy and online insult generators. "I'm probably more intelligent than Hillary," said Trump recently on MSNBC. Donald Trump wrestling with 'Stone Cold' Steve Austin after the the Battle of the Billionaires at the 2007 World Wrestling Entertainment's Wrestlemania April 1, 2007. Pro wrestling is not a sport for the modest and during his stint on WWE, Trump once told off McMahon with, "Your grapefruits are no match for my Trump Towers." Those kind of allusions have popped up on the campaign trail too, where Trump infamously bragged to Marco Rubio during a Republican debate about the size of his hands, and other parts of his anatomy. In professional wrestling it's common for a wrestler to take out a bounty on another wrestler. Similarly, after a Trump supporter hit a protester at a rally in North Carolina, Trump suggested he would help pay the supporter's legal fees although ultimately, there's no sign Trump actually paid the legal bill. Trump's WWE appearances were one of the first times he engaged with an unruly audience, said Court Bauer. "Some people thrive off of it, some people it eats them alive," said Bauer. "And he certainly didn't have any anxiety going out there, he seemed very confident whenever he'd go out there." There's also plenty of overlap between wrestling fans and Trump's voters, suggested Scott Beekman. "The traditional wrestling crowd is somebody's grandmother and your plumber, and that's the sort of folks [Trump] seems to be getting in enormous numbers at his rallies."